WASHINGTON, Mar 28 2014 (IPS) - The summary mass trial and sentencing of 529 Egyptians to death this week is yet another example of Egypt’s descent into lawlessness and blatant miscarriage of justice. The rushed decision showed no respect for the most basic standards of due process under the military dictatorship. Sisi, much like Vladimir Putin and his land grab in Ukraine, feels empowered to defy the U.S. because he perceives it as unwilling or unable to confront him. The Egyptian court spent less than a minute on each of the 529 defendants before sentencing them. Defence lawyers were barred from challenging state “evidence” and defendants were not allowed to speak. Yet, the Sisi government and the pliant Egyptian media did not question the sentences. The decision, according to the statement, “simply defies logic” and fails to satisfy “even the most basic standards of justice.” Amnesty International deemed the death sentences “grotesque.” Most Western countries have expressed “deep concern” over the sham trial and convictions and the hope the decision would be overturned on appeal. 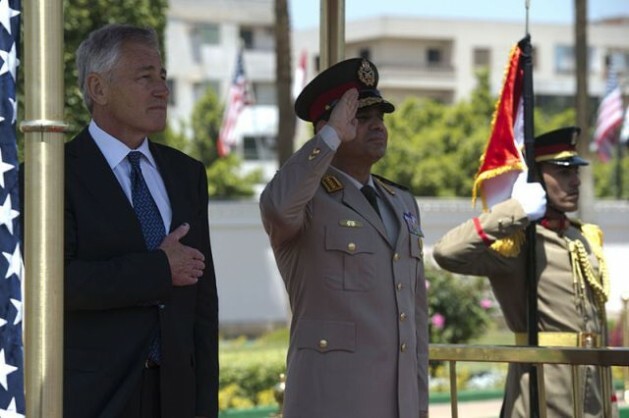 In his heady rush to seek the presidency, however, Field Marshall turned civilian Abdel Fattah al-Sisi is not paying much attention to Washington’s warnings or to international condemnations of the Minya judge who dispensed the ruling. Sisi sees the Barack Obama administration moving away from values of good governance and the rule of law in Egypt to a myopic doctrine of national interest, which includes coddling Arab dictators and tribal ruling potentates. Since the Arab upheavals of 2011, President Obama has identified U.S. values of tolerance, justice, fairness, and democracy as a guiding principle of post “Arab Spring” relations with Arab countries. These values, the U.S. president frequently said, “define who we are” as a people and as a nation. Sisi, on the other hand, much like Vladimir Putin and his land grab in Ukraine, feels empowered to defy the U.S. because he perceives it as unwilling or unable to confront him or to shun him or cut military aid to Egypt. He counts on Washington’s inaction against him despite rising lawlessness by state institutions because of Egypt’s pivotal standing in the region. By ignoring the Egyptian constitution and its traditional claim of judicial independence, the Egyptian judiciary seemed to kowtow to the military-run interim government. The mass death sentences coupled with Sisi’s announcement of his candidacy for the presidency seem to bring the coup that toppled President Mohamed Morsi full circle. For Sisi, the January 25 Revolution is history, and the demands for democracy are now subsumed under the rubric of fighting “terrorism”, which he equates with the Muslim Brotherhood. Sisi must have taken a page from the American Tea Party book about “taking back America” and from Putin about taking back Crimea. As if someone has stolen America from the Tea Party, or Ukraine from Russia, or Egypt from Sisi. In fact, it was Sisi and the military junta that stole Egypt from the January 25 Revolution in a military coup. It was Sisi’s regime that has put over 15,000 Egyptians – Islamists and secularists – in jail through illegal arrests, sham trials, and without due process for challenging the coup. Sisi envisions his presidency to rest on a three-legged stool of pliant media, submissive public, and adulation of him as a rising “selfie” star. In the name of “serving the nation,” Egyptians are being brainwashed not to question the personality cult of Sisi’s budding populist dictatorship. In addition to frightening the public into submission, Sisi has also shuffled SCAF by sidelining potential challengers like General Ahmed Wasfi and promoting supporters like General Sidqi Sobhi. He sees these actions as an insurance policy against a possible coup that could topple him, much like he did against Morsi. Although much has been written about Egypt in recent days, the death sentences and Sisi’s presidency have created two serious concerns, which Washington and other Western capitals must confront. First, these actions likely will result in a growing radicalisation of some elements within the Muslim Brotherhood and other groups in Egypt. Radicalisation usually begets violence and terrorism. It would be a nightmare scenario for any Egyptian government if the new radicals join forces with Salafi jihadists in Sinai. Such coordination, which could create an opening for al-Qa’ida in Egypt, would wreak havoc on the country and on Western interests and personnel there. Second, continued instability, lawlessness, and repression in Egypt under a Sisi presidency would begin to attract Islamist jihadists from Syria to Egypt. Unlike their counterparts from Afghanistan, the new jihadists are honed by combat experience and trained in the use of all kinds of weapons. A jihadist base in Egypt would certainly spread to neighbouring countries, including the Gulf tribal monarchies. To stem this nightmarish tide, the United States and its Western allies must urge Gulf monarchies to start serious dialogue with their peoples toward inclusion and tolerance. They also must convince Sisi that no stable political system would emerge in Egypt without including secularists and Islamists in the process. An adoring public, a pliant media, a sycophantic government, and an unfettered and corrupt military are a formula for disaster for the Egypt and the region.